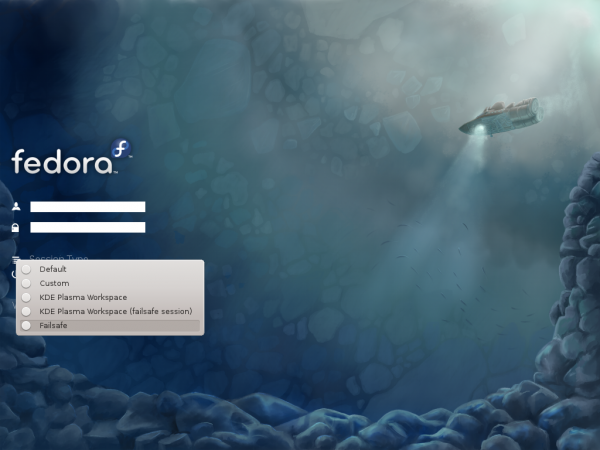 Fedora 16 is the latest stable edition of Fedora, a Linux distribution whose development is sponsored by Red Hat, Inc. The main edition uses the GNOME 3 desktop environment, but there are editions, called Spins, that use other desktop environments. The available Spins in order of popularity, based on download count, are: Fedora KDE, Fedora Xfce, Fedora LXDE, Security, Games, Design-suite, Scientific-KDE, SoaS, Robotics, and Electronic-Lab. This review is of Fedora 16 KDE. Though it has been more than three months since it was released, I do not think that is can be too late to do a review, provided it does not come too close to the release date of the next edition. Then it would be too late. I have covered some of the content in this review on other Fedora 16 articles (see the Fedora category page), but it does not hurt to repeat a few in this review. So, here we go! 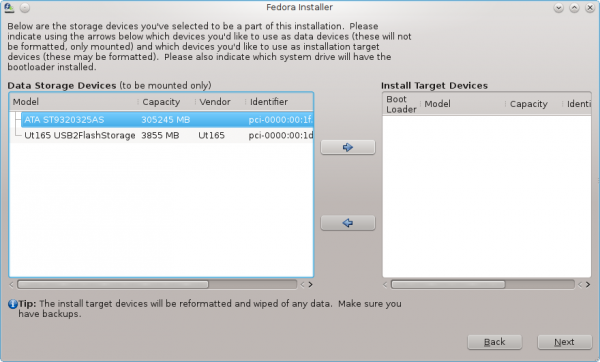 Fedora 16 is the first version of Fedora where the installer creates GPT partitions by default – in standalone installations. So if you are going to install Fedora 16 KDE or any version of Fedora 16, GPT is a new feature that you will encounter during installation. GPT, or GUID Partition Table, makes it possible to create more than four primary partitions, and partitions that are more than 2 TB in size. 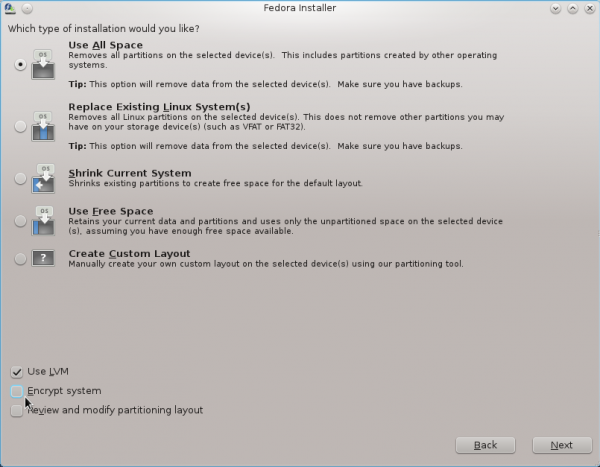 If you are interested in this subject, you might want to read Fedora 16 GPT disk partitioning guide. Another new feature is the option to disable LVM in any of the automated partitioning steps. LVM, the Linux Logical Manager, is still the default, but you may disable it and let the system create non-LVM partitions. Aside from LVM and GPT, I do not see any other new feature in the version of Anaconda in Fedora 16. Anaconda is the Fedora system installation program. A slightly modified version is used by Sabayon Linux. Though GPT partitions are created by default, on a system with existing, non-GPT partitions, the installer will default to creating standard (MBR) partitions. The screen shot below shows the GPT partitions that Anaconda creates, with LVM enabled. You can tell they are GPT partitions because the first partition has a bios_boot flag (Type= BIOS Boot). 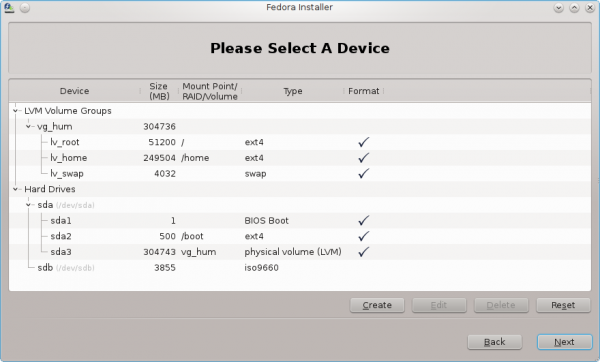 I have installed other Linux distributions from USB flash drives, but not Fedora. I did not expect that the installer will list the USB flash drive, where the system is being installed from, as a possible target disk. If it is not already obvious from the image below, the 3,855 MB disk is the installation USB flash drive. 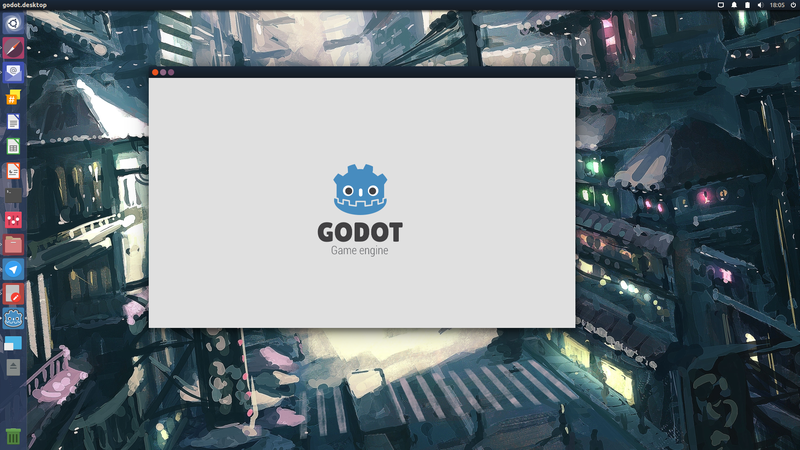 Logging In And Using The System: Every new Fedora edition features a beautiful wallpaper. You can see that right from the login screen. 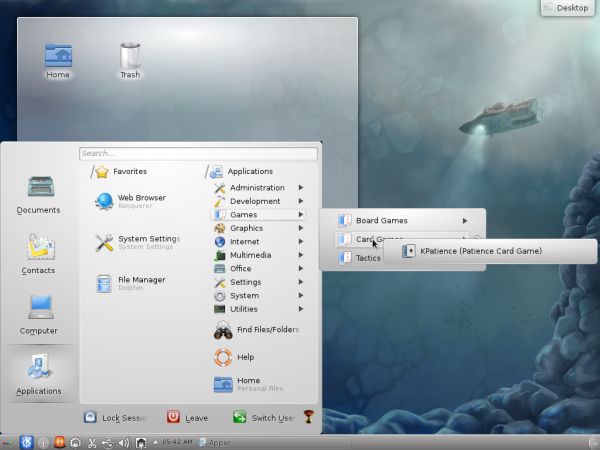 The desktop itself is powered by KDE 4.7.2. This image shows the desktop with the Lancelot menu, which is not the default menu style. 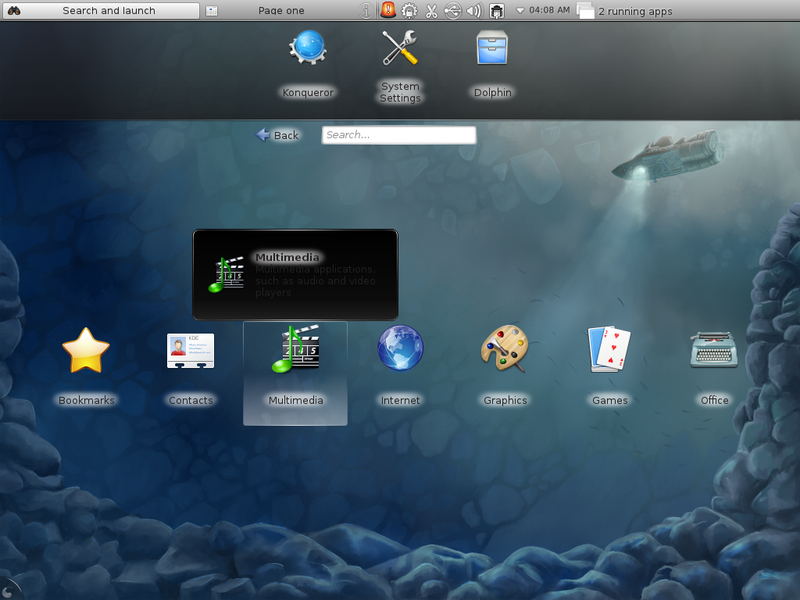 You may view a screen shot of the desktop with the Kickoff menu, the default menu style here. A customary screen shot of the KDE Plasma Netbook interface, one of several such interfaces designed for small screens, but which works just as well on wider screens. The system comes with the usual cast of native KDE applications, one of which is Amarok, my least favorite audio player. And that stems from the fact that playing an audio CD with Amarok is a lot more difficult that it should be. In fact, it should not even be difficult to begin with. 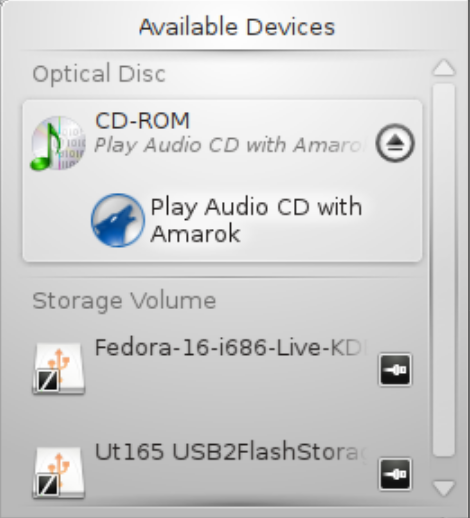 I think that at some point after it was first released, Amarok’s developers forgot that users still have audio CDs that they would like to play on their computers. It is a good thing that KsCD, a pure audio CD player that just works, is also installed by default. I have been wanting to check out the new version of Fedora, although I use XFCE and am not a big fan of KDE or Gnome. I am running 15, but haven’t had time to upgrade yet, although I think I may do it tonight. In the FWIW department, in order to get Amarok to play CDs it’s necessary to install the phonon-vlc backend. 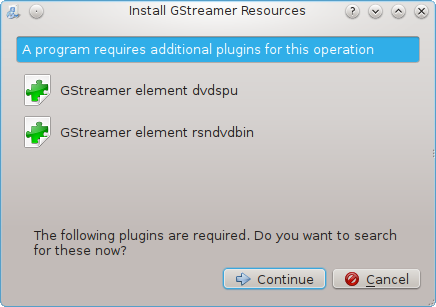 Gstreamer doesn’t work for some reason. In fact, I saw that the vlc backend was recommended on a KDE site. With luxi fonts please . . . Very good and technical review, but take note that Fedora 16 was officially released on November 8. Fedora is my favourite Linux distribution. It’s cutting edge, but, in the same time, I find it to be a stable and polished operative system (especially after the initial phase of upgrading). So far so good, no particular problems (right now I’m typing from F16 Gnome, but I use F16 KDE as well). No problems in printing with a printer connected via wireless (after installing the proprietary driver supplied by the hardware producer). Installing all the codecs and multimedia stuff is easy, but, obviously, you have to know the procedure. Anyway (for those who don’t know that) there are very good programs like autoplus or easy life that make very easy to install all the needed software. Long story short: I recommend it! KDE’s far better than gnome and gnome shell. However, I don’t like KDE Fedora spin is loaded with trash from gnome. Because of this I’m using Kubuntu. Nice review, as usual… Lots of pictures and descriptive text. I liked Fedora KDE too… Until broke it. 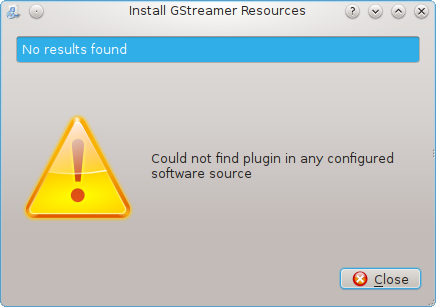 I wonder why people bother to review a distro’s Live version.